•	Myocardial infarction (MI) refers to death of a portion of the heart tissue. In many cases, it is an acute event usually due to sudden rupture of an atherosclerotic plaque in the wall of a coronary vessel. •	Acute myocardial infarction (AMI) (heart attack) is one of the leading causes of death in the developed nations. The global prevalence of the disease is nearly three million cases annually. 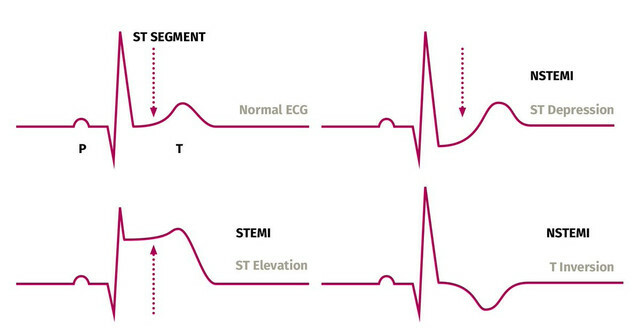 •	Acute myocardial infarction can be divided into two categories namely non-ST-segment elevation MI (NSTEMI) and ST-segment elevation MI (STEMI). Unstable angina (UA) is similar to NSTEMI. However, cardiac markers are not elevated. •	Immediate reperfusion in STEMI – The first step in treating an acute ST-elevation myocardial infarction (STEMI) is prompt recognition, since the benefits of reperfusion therapy are greatest when performed as soon as possible (preferably within 90 minutes). Preferred treatment is PCI if available. Before PCI, patients should receive dual antiplatelet agents including intravenous heparin infusion and ADP (adenosine diphosphate) inhibitor receptor (P2Y2 inhibitor) such as ticagrelor. Additionally, Glycoprotein IIb/IIIa inhibitor or direct thrombin inhibitor can be administered during percutaneous intervention. •	Mechanical - Heart failure, LV aneurysm, cardiogenic shock, mitral valve dysfunction, cardiac rupture. •	Arrhythmias - Atrial or ventricular arrhythmias, sinus or atrioventricular (AV) node dysfunction. •	Thromboembolic - Stroke or peripheral embolisation.